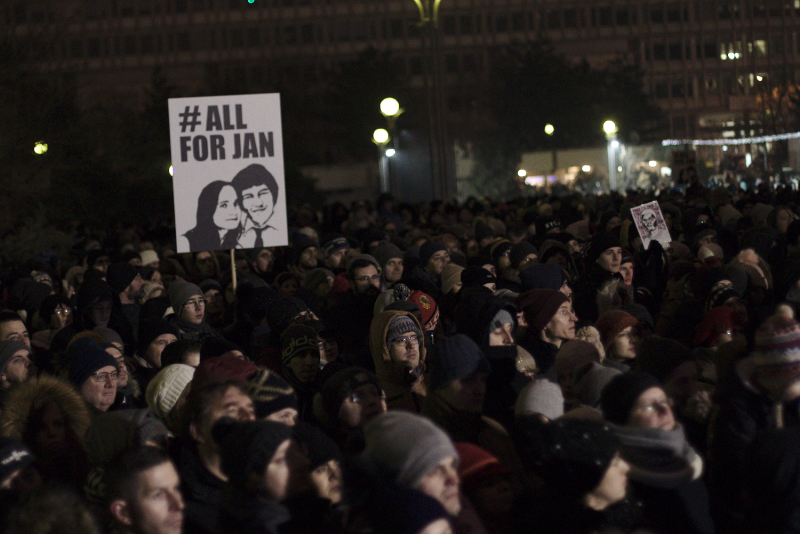 #AllForJan demonstration in memory of murdered journalist Ján Kuciak and his fiancée Martina Kušnírová in Bratislava, 2 March 2018. Photo by Peter Tkac, CC BY-SA. Businessman Marián Kočner has been charged with ordering the killing of journalist Ján Kuciak and his fiancée Martina Kušnírová in 2018, according to a March 15 announcement by Slovakia's Special Prosecutions Office. Before he was killed, Kuciak was working with the Organized Crime and Corruption Reporting Project (OCCRP) and his outlet, Aktuality.sk, to investigate possible links between an Italian criminal group and its presence in Slovakia. He also wrote about the business dealings of Kočner. The murders caused widespread shock in the country. Demands for justice led to massive protests which forced the resignation of then Prime Minister Robert Fico. Kuciak was the real target while Kušnírová was killed for simply being in their house when the killers barged in. They were both 27 years old and had planned to marry in May 2018. According to the prosecution, Kočner personally threatened Kuciak by phone in September 2017 and then ordered the murder that took place on 21 February 2018 in the village of Veľká Mača. Slovak law enforcement initially detained four people for the killing of Kuciak and Kušnírová. Kočner's assistant Alena Zsuzsová was accused of paying 50,000 euros (about US $57,000) in cash and the forgiveness of more than 20,000 euros (about US $22,700) in debt to three people – a pizza parlor owner, a former police officer and a former soldier – to organize and commit the murder. During the summer, Kočner was arrested for financial crimes investigated by Kuciak, but it took authorities six more months to arrest the subordinates of the controversial entrepreneur and directly connect him to the assassination plot. “The reason for the murder was the journalistic work of the victim,” a special prosecutor, who was left unnamed for security reasons, told reporters at a March 15 news conference near Bratislava. 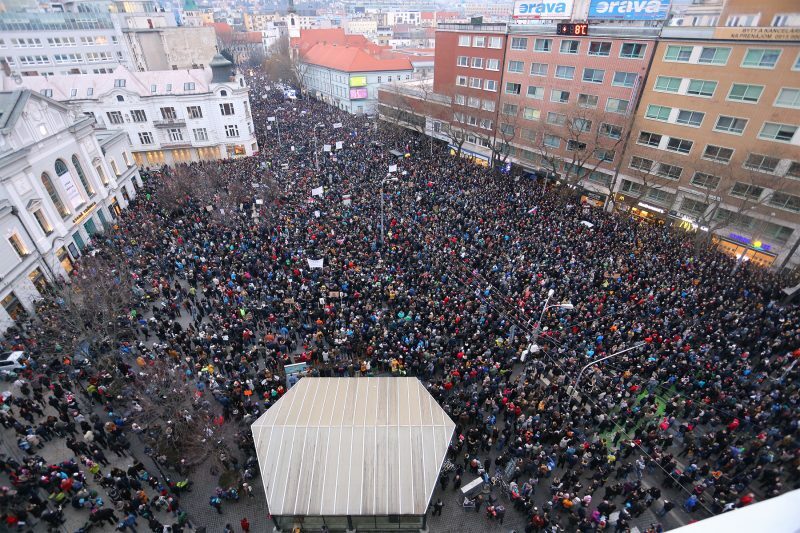 Protest in Bratislava on 9 March 2018 in response to the murder of Ján Kuciak and Martina Kušnírová. Photo by Slavomír Frešo via Wikipedia, CC BY-SA 4.0. In May 2018, Kuciak was posthumously awarded the inaugural award for Journalists, Whistleblowers and Defenders of the Right to Information, by the European United Left/Nordic Green Left (GUE/NGL) in the EU Parliament. Named for slain Maltese journalist Daphne Caruana Galizia, the award is intended to recognize the work and courage of individuals in exposing corruption and wrongdoing by the powerful. After Kuciak was murdered, OCCRP and its member centers completed and published some of his unfinished research. In February 2019, they released a report based titled “Unfinished lives, unfinished justice.” This was compiled by OCCRP, the Investigative Reporting Project Italy, Investigace.cz, and the Investigative Centre of Ján Kuciak (ICJK) based on Kuciak’s reporting about organized crime in Slovakia and its ties to politics and law enforcement. But ICJK revealed via Twitter how some authorities were not cooperating with them and that they were prevented from attending the press conference announcing the indictment of Kočner. Despite the fact that authorities have now charged the alleged mastermind of the killing, journalists and media advocates insist there are still unresolved questions related to the case, such as the rumored involvement of prominent politicians. In particular, advocates are interested in learning what the former prime minister Fico and Robert Krajmer, former head of the Anti-Corruption Unit of the Slovak National Crime Agency, may have known about the murders. Friends and family of Kuciak and Kušnírová have already asked authorities to investigate the ties of newly indicted Kočner with powerful officials that protected him over the last two decades. Kušnírová's family lawyer is worried that Kočner's close friendship with Slovakia’s former general prosecutor, Dobroslav Trnka, could affect the progress of the case.